The US-Americans are passionate sailors all right, not for nothing have they defended their “pitcher”, the America’s Cup fervently for ages. This country – formerly land of opportunities – boasts miscellaneous very attractive sailing andyacht charter waters for sure. And yet it still hasn’t come to be a typical yacht charter destination for Europeans. Though it’s even possible to sail into the heart of the mega city New York by yacht. The most important charter beats are the east coast with New England and Florida and the U.S. Virgin Islands – but also the Pacific coast of California, the great lakes and even Alaska may be very enticing for people who want to experience and sail unique areas. Thanks to the America’s Cup, Newport Beach or San Diego Beach in California are already known as a sailing arena but all coastal areas can be sailed. A beautiful getaway – especially on a short trip in the context of a shore leave, leads from Marina del Rey, the vast yacht harbour near Los Angeles, to Catalina Island. Here yacht charter crews can anchor in the Bay of Avalon and visit the picture perfect island on foot. The island owner Wrigley even has some bison here. And the Pacific coast isn’t the only sailing beat: the Californian lakes too, notably Lake Tahoe, have lots to offer for boating fans. In the height of summer New England in the East of the USA is a very enticing yacht charter destination, especially Massachusetts, Rhode Island and Connecticut: picturesque architecture, fishing harbours, marinas, excellent cuisine with clam chowder, lobster and everything fish-fans love – notably the area around Cape Code with the vivacious town of Provincetown south of Boston is a Mecca for sailors, with Newport, the island of Martha’s Vineyard, Nantucket Island and Cuttyhunk or the bay of New Haven. Yacht charter sailors should be able to handle tidal navigation. Typical wooden houses ashore, small whitewashed churches made from wood, country houses and mansions of the American moneyed aristocracy – New England’s history dating back to the times of the Mayflower, is vivid everywhere. Off the noble Newport Yacht Club races have been sailed in pursuit of the America’s Cup. Everywhere wooden boats are still visible, which have been built according to old North-American boatbuilding tradition – however meeting point for sailors is Camden further north. The vast bay of Marblehead near Cape Ann, home of the Boston Yacht Club, the Isles of Shoals, the exclusively expensive Kennebunkport or Portland could make perfect stop-overs for yacht charter crews on the way to Maine. And in Tenants Harbour, home to the lobster fishing industry, the best of the famous Main-Lobsters wait as a reward. Farther to the South, the whole metropolitan area of New York with many islands around and yacht harbours in the middle of the city is a spectacular sailing area. Maryland – on the border of Virginia – is fascinating with the yacht charter area in the Chesapeake Bay – there is a very good yacht charter base with a large fleet of sailing yachts for charter in Annapolis. Another good base for starting your Yacht charter cruise is Newport on Rhode Island with a large charter base. North Carolina with Jacksonville and Amelia Island is well know for yacht charter activities as well. Florida, the Sunshine State on the southeast coast has a much longer season. From a tourist’s point of view, Florida is more known for Disneyland or Seaworld in Orlando, for the Everglades and of course Miami, attractive for yacht charter crews with the art deco quarter in South Beach and the Ocean Drive as well as the Calle Ocho with its Cuban flair. 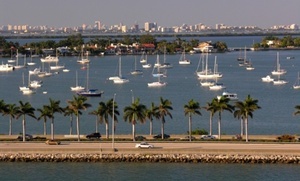 Several marinas cater for the perfect maritime infrastructure for Yacht Charter bases – not only the east coast on the Atlantic is worth seeing but also the Gulf coast of Florida is very interesting for yacht charter crews – with Tampa, Naples, Marco Island, Sarasota, St. Petersburg and Clearwater. The Florida Keys, islands and islets leading like pearls on a string far south with reefs and dream beaches rank among the highlights of a charter trip in Florida. Everyone, watching sports fishers off Isla Morada or tracing the footsteps of Hemingway in Key West, enjoying their sundowner with a view onto Key West, will quickly become a veritable Florida-fan. The exploration of Florida’s inland waters is particularly appealing – for example on a motor yacht on the Intracoastal Waterway with a view onto the mansions of the bold and beautiful and lots of nature. Florida is also the starting point for trips to the Bahamas or the Bermudas. Yacht Charter bases in Florida are in Miami, Fort Lauderdale, Key West, St. Petersburg / Palmetto and other location at the US Atlantic coast or Gulf Coast. The US Virgin Islands with over 50 islands, equally popular among Americans as cruise destination as well as a yacht charter destination, are of course accessible via yacht from the British Virgin Islands – we are happy to inform you about entry requirements. Ports of entry are Charlotte Amalie, the main town located on St. Thomas, Cruz Bay on St. John and Christiansted in Gallows Bay on St. Croix, the largest island. The yacht charter section is still continuing to boom and there are yacht charter bases in abundance on the US Virgin Islands. 13 well equipped marinas are at the disposal of yacht charter sailors, several of them already equipped with W-LAN, Yacht Haven Marina even offers cable TV. There are numerous designated anchorages and mooring buoys, as well as a National Park Mooring System. The US Virgins are scenically beautiful but regarded rather crowded and a paradise for power shopping. Be aware: The US Virgins are less safe for Yacht Charter crews than the British sister islands: the outboard motor should be made theft-proof by all means! In case, you wanted to charter a yacht in the USA but were unable to find a suitable one in the Yachtfinder, we are more than happy to organise your charter yacht in the USA. And to get around try Car rental USA: USA cars rental suits the needs of every travelers – you don’t have to waste your precious time to decide which car hire company to choose.